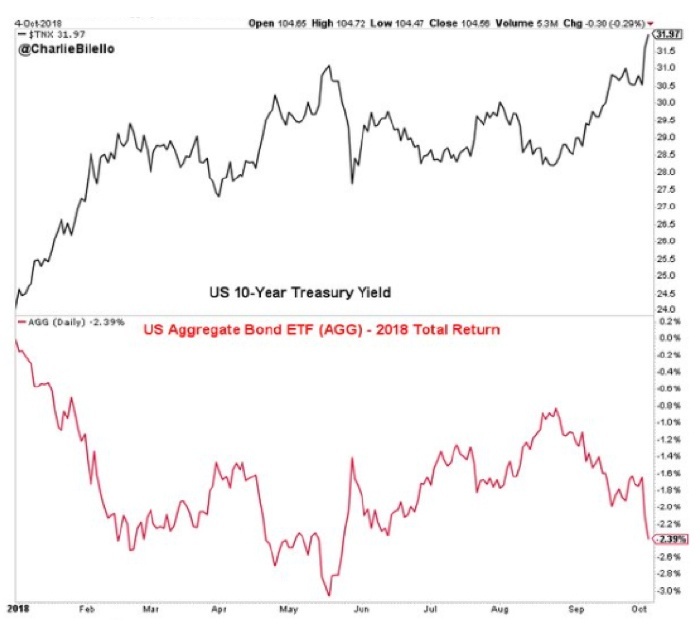 According to a recent Bloomberg radio segment, “60% of bond ETFs have a negative 12-month performance,” due to the slowly rising interest-rate environment. “Bond investors are running from anything that smells of interest-rate risk. Investors pulled billions of dollars from exchange-traded funds that track longer duration fixed-income plays, as Treasury yields resumed their upward march. In fact, the top four outflows for U.S.-listed ETFs on Tuesday were all fixed-income related, as investors also yanked cash from funds stuffed with junk bonds, according to Christian Fromhertz, chief executive officer of Tribeca Trade Group. One of the major bond ETFs, which acts de facto as a benchmark for many bond investors, is the iShares Core U.S. Aggregate Bond ETF, ticker AGG. AGG, says ThinkAdvisor, suffered its “biggest single outflow in the fund’s 15-year history” last week as investors pulled $2 billion on Tuesday alone. “The Bloomberg Barclays U.S. Aggregate Bond Index, linked to trillions of dollars of fixed-income, is on track to post its second-worst showing in history. “The index is one of the most widely used barometers for bond-fund managers and is associated with more than $20 trillion of assets. Its poor performance underscores how fixed-income markets have struggled amid a strengthening U.S. economic backdrop, which has prompted the Federal Reserve to continue to raise rates and consequently driven bond prices lower and yields to multiyear highs.